Identity Theft is one of the worst things that can happen to your personal finances. When someone assumes your identity they can ruin your credit score and destroy your financial reputation for years. Identity theft is a growing crime, but there are some important measures you can take to avoid having your identity stolen. The Federal Trade Commission maintains an Identity Theft Awareness website that outlines three important steps for avoiding identity theft: Deter Identity Theft, Detect Identity Theft, and Defend Against Identity Theft. Using these three steps can save you from an expensive and damaging experience. A new type of Identity Theft currently making the rounds deals with jury duty. Thieves are identifying themselves as U.S. Court jury coordinators, and contacting people to inform them they have been selected for jury duty. After informing the person they have been selected for jury duty, they ask to verify personal information over the telephone. Of course, most people state they have never received a jury summons, and the “jury coordinator” asks to verify their name, address, birth date, and Social Security Number so they can cancel the arrest warrant that has been issued in their name. They may also ask to verify credit card numbers. This scam works on intimidation by threatening people with a fictitious arrest warrant. Don’t fall for it! The court system will not ask you for your personal information. If you receive a call like this, ask them for a phone number where you can call them back. Then verify that information is the same as your local court. If you receive a similar call, contact your local police station, and the FBI. This scam has been verified by the FBI. There is a phishing scam going around purporting to be from the IRS. In this e-mail, they inform the recipient they are entitled to refunds of $92.35 or some other amount due to a calculation error on a past tax return. These e-mails are not from the IRS; they are from thieves who are attempting to extract your personal information to steal your identity and rack up thousands of dollars in charges they will make on your credit. The IRS will never request your personal information via email. In this e-mail example, recipients were advised to go to a link and enter their identifying information that would normally be on their tax form, (i.e., name, address, DOB, SSN, etc.) in order to process their refund request. The IRS never sends e-mails requesting personal information; they always send letters advising the individual of a pending problem. These scams always turn up with renewed force during tax season, when many recipients act without thinking. Never enter your identifying information into a website without understanding exactly why you are doing it and where the information is going. For these types of e-mails, it is best to NEVER click on the link in the e-mail. Instead, type the url directly into the web address bar in your browser. Phishing. Phishing is a technique used by identity thieves to acquire personal financial data in order to gain access to the financial accounts of unsuspecting consumers, run up charges on their credit cards or apply for new loans in their names. These Internet-based criminals pose as representatives of a financial institution and send out fictitious e-mail correspondence in an attempt to trick consumers into disclosing private information. Sometimes scammers pose as the IRS itself. In recent months, some taxpayers have received e-mails that appear to come from the IRS. A typical e-mail notifies a taxpayer of an outstanding refund and urges the taxpayer to click on a hyperlink and visit an official-looking Web site. The Web site then solicits a social security and credit card number. In a variation of this scheme, criminals have used e-mail to announce to unsuspecting taxpayers they are “under audit” and could make things right by divulging selected private financial information. Taxpayers should take note: The IRS does not use e-mail to initiate contact with taxpayers about issues related to their accounts. If a taxpayer has any doubt whether a contact from the IRS is authentic, the taxpayer should call 1-800-829-1040 to confirm it. The IRS also gives information on how to report suspected tax fraud activity. The next step is to detect identity theft if it has occurred. 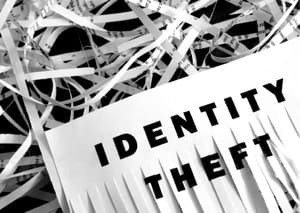 The more quickly you discover identity theft, the easier it is to limit the damage to your credit and the easier it is to get the situation resolved. Monitor your credit report and look for errors. Everyone is eligible for 1 free credit report per year from each of the three major credit bureaus – Equifax, Experian, and TransUnion. You can order these free credit reports from AnnualCreditReport.com. The most effective way to monitor your credit is to stagger your free credit reports and get a free credit report from each of the three major credit bureaus every 4 months. Use an identity theft protection company to monitor your credit reports, scores, and financial accounts. (See trial offers below). Use a credit monitoring service to monitor your credit reports. Receiving unexpected bills for items you did not purchase. Calls or letters from bill collectors or creditors for items you did not purchase. No longer receiving expected bills. Denials of credit when you should be qualified. You should make it a habit to review your financial statements on a monthly basis and get into the habit of getting your free credit reports. Credit Karma – free service to monitor your credit reports. GoFreeCredit.com – 30 day trial offer. These offers may help you prevent, discover, and repair identity theft problems. Review your credit reports carefully to determine where the security breach occurred. Close accounts that have been tampered with, or that you suspect may have been accessed fraudulently. File a police report where the theft took place. Most creditors will want proof that a crime has been committed. You can also place a credit freeze which will prevent anyone from opening new accounts in your name. This will not stop them from using accounts which have already been opened, which is why it is important to close any account that has been tampered with. Special steps should be taken to help protect children against identity theft. Phishing: a high-tech scam that uses e-mail or websites to deceive you into disclosing your credit card numbers, bank account information, social security number, passwords, or other sensitive information. How to protect yourself: Companies will never ask for sensitive information via e-mail. Never click on links in suspicious e-mails; instead, type the url into the address bar. Espionage: The act of obtaining, delivering, transmitting, communicating, or receiving information about the national defense with an intent, or reason to believe, that the information may be used to the injury of the United States or to the advantage if any foreign nation. How to protect yourself: In this example, you can consider yourself the United States, and the national defense is the protection of your personal and financial information. Espionage would be equivalent to identity theft – or any attempt to obtain your personal information to use against you or to benefit someone else. Defend your personal information as you would defend your life. Hacking: Illegally accessing other people’s computer systems for destroying, disrupting, or carrying out illegal activities on the network or computer systems. How to protect yourself: Hackers will attempt to access your personal information to steal your identity, or simply to cause destruction to the system. This could stem from an attack on your personal computer or a commercial computer system that harbors your information. The best method of preventing this is to maintain up to date firewall and anti-virus measures and scan all downloads and executable files before opening them. Malicious Logic: Hardware, software, or firmware capable of performing an unauthorized function on an information system. How to protect yourself: Examples of malicious logic include AdWare, SpyWare, Trojan Horses, Keyloggers, and other similar programs designed to record information or cause damage to your system. The best method of preventing this is to regularly scan your hard drive for these programs, maintain up to date anti-virus measures, and scan all downloads and executable files before opening them. Social Engineering: A euphemism for non-technical or low-technology means – such as lies, impersonation, tricks, bribes, blackmail, and threats – used to attack information systems. For example, an unauthorized person who attempts to gain passwords by posing as a service technician with an urgent access problem. How to protect yourself: The majority of identity thieves know the criminal responsible for stealing their identity. Often, their information is stolen by people piecing together bits of their information until they are able to gather enough information that they can assume their identity to apply for credit, take out loans, write checks, and otherwise ruin your financial well-being. Always safeguard your personal information around everyone – neighbors, friends, co-workers, and even family members. All things being equal, a thief will go after a soft target before they go after a hard target. So take precautions at home and away from home. Financial paperwork – credit cards, bank account numbers & statements, investment statements, etc. And it should go without saying, but if you keep a lot of cash at home, you should hide it safely. If you enjoy shopping online, you can get some great deals, save time, and avoid frenzied crowds during the holidays. However, making purchases with the convenience of an Internet connection isn’t without risks. If someone steals your debit or credit card number, they can go on a shopping spree until you wise up, report the fraud, and change your account numbers. If an identity thief nabs your Social Security number they can open up new accounts or loans in your name, buy expensive stuff, and leave you with past due bills and a botched credit report. Be sure to secure your wifi signal at home, and only use secure wifi when away from your home. Try to avoid logging into your financial or other important accounts over an unsecured wifi signal. It’s better to either do this from home, or to log in using a VPN (virtual private network). When you go online in a public place, like a coffee shop or library, remember that hackers who share the Wi-Fi connection can track the websites you visit and what you type. That’s why it’s dangerous to make online purchases or enter any private information on an unsecure connection. Instead, do your shopping from a secure connection at home. Another option is to make purchases using your mobile phone—or to tether a device to your phone—because mobile data is encrypted, which makes it much safer than a public Wi-Fi connection. When you find something you want to buy online, consider the reputation of the website. If you’re unfamiliar with the company or aren’t sure if it’s safe, don’t make a purchase just because the price is low. Also, don’t follow a link in an email to an online store because it could be controlled by a cyber-criminal who simply wants your confidential data. Type the website address directly into your browser to make sure you’re going to the right site. Strong passwords are a requirement for secure computing. If you need to create an online account to make a purchase from a website, be sure to create a new, unique password. As tempting as it is to use the same password over and over for all your online accounts, it’s very dangerous. A thief who steals one password puts all your accounts at risk. I recommend using a password manager to create and store strong passwords that have no easy way of being guessed. Use a combination of upper and lowercase letters, numbers, and symbols. Also be sure not to use a word that can book looked up in the dictionary. Once you load up a web site’s shopping cart, make sure that you enter your personal data, like your address and credit card number on an encrypted web page. Encryption is a security measure that scrambles your information while it’s in cyberspace and requires a key to unscramble it on the receiving end. You’ll know a web page is safe when the “http” in the web address changes to “https” (the “s” stands for secure). Also, look for a locked padlock icon on the page that you can click for additional security information. When you make online purchases, always use a credit card instead of a debit card. Credit cards offer much more protection if someone steals your number and makes fraudulent purchases without your knowledge. If you’re uncomfortable entering your credit card number on a website, don’t swear off online shopping. Some card issuers offer virtual credit cards, which are designed to be used online in place of your real credit card number. A virtual card has a temporary number that can only be used once or with a specific merchant, so a criminal would be out of luck if they stole it. You can also use a virtual credit card number, which allows you to shop online without exposing your credit card number to vendors. It’s important to review each of your bank and credit card account statements at least once a month. Match your debit and credit card receipts to make sure that you were charged the right amount and that there are no fraudulent charges. You have the power to prevent many forms of identity theft if you are vigilant with your financial records and actions. While you may not be able to prevent every instance of identity theft, these steps will go a long way toward protecting you, your credit report, and your personal finances. Good luck! Editor’s Note: Laura Adams contributed to this article. All good advice Ryan. ID theft is one of those things that sticks with a victim for a long time and creates a lot of headaches. One thing I always warn people about is not to give out any information, especially via phone or e-mail, unless they are 110% sure of who they are speaking to. Scammers will send e-mails or place phone calls pretending to work for a credit card company, the IRS, etc. Unsuspecting people give out personal information. As far as the IRS, they will never contact someone by e-mail. If you get an e-mail from someone claiming to be from the IRS, you can and should report it. You just forward the e-mail to [email protected] There’s information about phishing scams at the IRS web site www.irs.gov. Great advice, as always! Another thing to watch out for is the growing crime of child identity theft. Some thieves are actually stealing the identities of children, so you have to be careful. The fact that this information is even available for them to steal is somewhat disheartening. Miranda: Great point! This is a growing crime and often isn’t discovered for years after the fact. One common form of child identity theft isn’t even for credit, but to get a social security number for illegal immigrants so they can work. This form of ID theft is often found when the IRS comes after children for back taxes! Do you recommend one over the other? I have heard great things about lifelock, to be honest since I’m so young and don’t have the financial risks as others I wasn’t thinking of buying, but always good to research. Craig: I don’t recommend any of the Identity theft programs over the other. If all you are concerned about is getting your credit report checked for identity theft, then getting a free trial to one of these companies and then promptly canceling it might be a good way to check your credit report for identity theft and get peace of mind without spending a lot of money or making a big financial commitment. Great artilce that I would like to link on my site. It interests me because my mail was part of an FBI recovery several years ago. I learned that this really happens! It can be worth investing in a locking mailbox, too, especially if you live in a rural area where the houses tend to be set back far from the road. I know at least one person who had mail stolen and the information was used to open up credit cards in her name. Definitely a big concern of mine. I shred ANYTHING with my name on it, including junk mail. I’m also considering one of those identity theft services at some point.